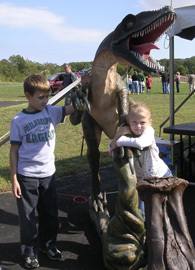 DASEF (Delaware AeroSpace Education Foundation) offers early childhood experiences thatcreate an exceptional learning environment that inspires children and their families with a sense of appreciation for the earth and its place in the universe. The DASEF vision is driven by the belief that "Wisdom Begins with Wonder." By linking the classroom experience with real-life experience, it is our hope that learning will contribute measurably to enriching young children in Delaware. (302) 659-5003 or (302) 834-1978 or by emailing: dasef.outpost@gmail.com. (3 children/1 adult). The programs are 1 hour in length with a fee of $5.00 per student with a minimum fee of $200.00 per program. A classroom space is needed to bring this traveling program to your school. We can work with 20 to 25 students at a time. We work with one group of 20 to 25 children, then make the same presentation to the next group of 20 to 25, and so on, until all of your children have had the program that day. Has your little scientist ever taken apart a kaleidoscope? You and your child will explore kaleidoscopes using a tabletop model and make and reflect a geometric design into infinity! Also make and take your own simple kaleidoscope viewer. You can even check out a few dazzling books while you’re there. What fun! Did your child ever get “bugged” by an insect? Come to the library to study some friendly ones. Your child will learn about the life cycle of a ladybug and the life cycle of a Monarch butterfly, with little hand-sized models. See our collections of dearly departed insects and work with your child to create their own insect model. Take home a picture of an insect to color. Plus you’ll find insect books by Eric Carle – need we say more? Calling all mini-meteorologists – it’s time to learn about the weather. Your child will “be” the liquid in a thermometer, as they learn about temperatures and how to dress for them. Have fun making a take home wind sock and a simple kite to experiment with wind. And just think about all of the wonderful weather books at the library! The forecast is for interesting science with a good chance of fun! Too young for a scary trip through Jurassic Park? Our dinosaurs are much more tame. Complete a dinosaur puzzle, make and take a dinosaur mask, built your own dinosaur with Clicks building sets, and learn a little about meat and plant eaters with a bucket of our prehistoric pals. Bring your camera for a photo-op with our interactive Sarah, the Stegosaurus. You’ll rooooar for more! There is more to trees than meets the eye! Learn about all those parts of a tree you don’t see, use a hand lens to take a closer look at leaves and find matches for the ones from the same tree, and make a model of a tree from real parts. Finish your day by “being” a seed as it goes from its hiding place in the soil to a tree with new seeds of its own. You will even find a treeful of books to read. Tree-rific! Get right down on the floor and build something! Use our pieces to make your own structure, and make a roller coaster that will give a ball a looping thrill ride. Take the challenge to build the tallest tower – quickly, before it falls! And take home a picture of one of the world’s great bridges to color. Build a great day with us! It’s time to get right down on the floor and build something! Your students will use our giant Lego © pieces and their own creativity to make a structure, a vehicle, and an animal. They will build a roller coaster model that will give a ball a looping thrill ride. And they can take the challenge to build the tallest tower before it falls! Build a great day with us! It’s time for little pilots to take flight! You and your child will learn about how things move through the air by folding and flying amazing paper airplanes and helicopters, building a simple kite from paper and straws, making a straw glider, and testing our hover craft that can float on a layer of air. As they say, “The sky’s the limit”! Looking for a new way to stimulate your students’ sense of hearing? We’ll bring a batch of materials and activities to let them explore the world of sound. They will play our water glass piano, guess the mystery sound makers in a series of jars, see how water carries sound waves across our Dancing Water Bowl, test the differing pitches of our Boomwhackers, and make and take a rhythm shaker (each child brings an empty plastic soda bottle). Your room will come alive with sounds! Calling all “attractive” youngsters with a “magnetic personality”! It’s time to come to the library to learn lots about magnets. You’ll start by seeing and hearing a read-aloud of our Magnets Big Book. Then use special object collections to discover which materials magnets attract, test various magnet shapes to see their magnetic fields, play with attracting and repelling poles of circular magnets, go “fishing” in the magnetic fish pond, and make and take a refrigerator magnet. This science will stick with you! 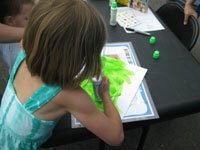 Bring your young undersea explorer to the library for a trip to a coral reef. You and your child will learn about forces, assemble a beautiful coral reef puzzle, use your imaginations to make a coral reef and its inhabitants from Shapescape building pieces, color some fish and other life from the coral reef, and make and take a coral reef scene as you learn about this fascinating ecosystem. No scuba gear required – just an inquisitive mind! Butterflies can’t really do math, but your young mathematician can! You and your child will play the Butterfly Symmetry Game and decorate a coffee filter butterfly, practice grouping and counting with plastic butterflies, put on our kid-size wings and identify geometric shapes, and make pattern caterpillars. Bookworms aren’t the only insects that can have fun at the library! Give your young engineer some challenges in design and construction that make things move! You and your child will build a structure with moving gears, assemble and test a model vehicle, build and experiment with magnetic gears, and make and take your own climbing creature or tumble wing glider. Dust off your thinking caps – you’re going to need them! Can’t take your students to a fossil dig site? Bring our fossils to your classroom. Your students will learn how fossils were formed and assemble a floor model of a Protoceratops dinosaur skeleton. They will match fossil imprints to the mammal foot that made them, see real fossils and petrified wood from our collections. And they’ll each make a model of a dinosaur skeleton to take home. Let them explore the world beneath their feet! A whale right in your classroom?? No – a right whale in your classroom. Your students will see a life-sized model of a juvenile right whale, learn about its life in the sea, and practice their measuring skills on him. They will also search a book for hidden sea creatures, hide one in a camouflaged drawing, and make and take a whale that will fit in little hands. Ahoy, young oceanographers! 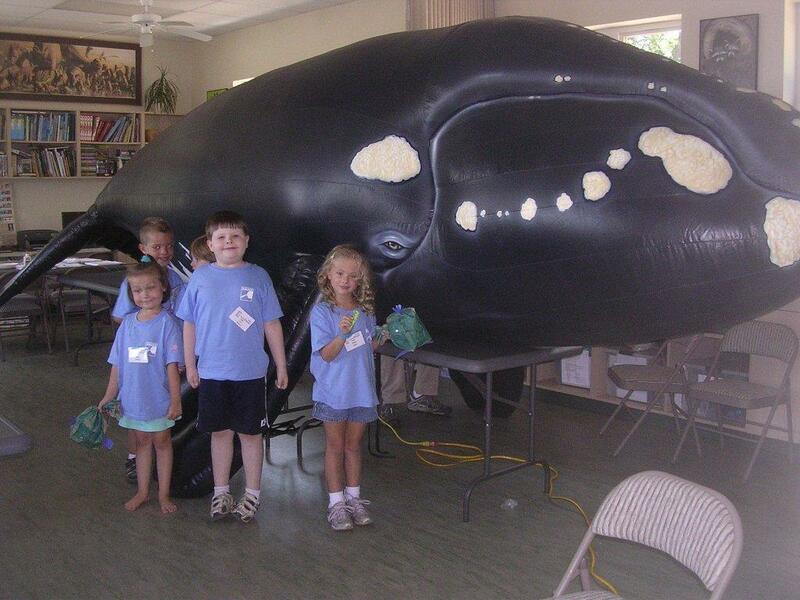 Attention teachers: enough tabletop space in your room (or an unused hallway outside your room) is required to accommodate the 4’ diameter and 20’ long inflatable right whale, with room around tables for parents and children to walk. Did you see the baby elephant by the bookshelves?? No, that’s not the beginning of an elephant joke – schedule this program for your students and they’ll meet Ellie, a life-sized inflatable baby elephant. They will also practice measurement skills, trace a hand to make a handprint elephant, turn a paper plate into an elephant’s face, assemble a pop-up book of elephant facts, and make a paper bag elephant puppet. Our books about elephants will give you and your young scientist the latest information about the endangered elephant. 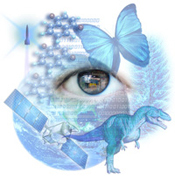 Join our science safari! 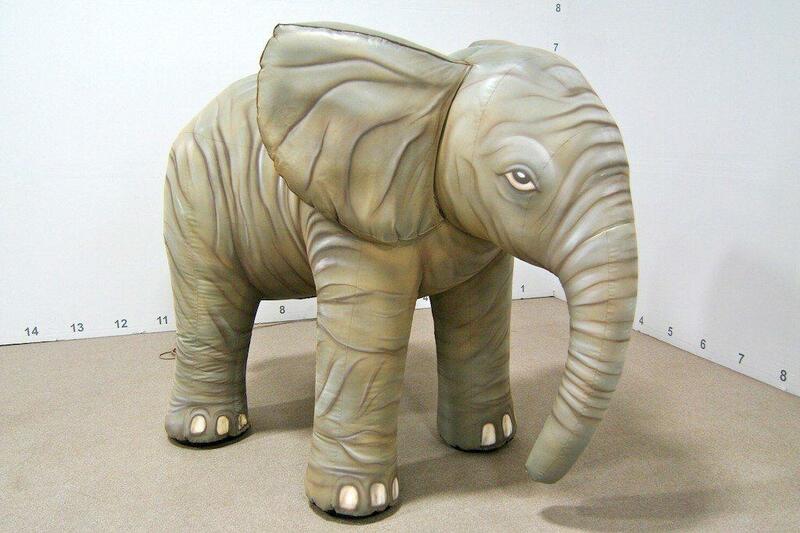 Attention teachers: enough floor space is required to accommodate the 6’ high and 8’ long elephant, with room for parents and children to walk around it. There’s a giant panda visiting the library today! Attend this program and you and your child will meet Perry, a life-sized inflatable giant panda, and learn about his struggle to survive. You will also measure and compare yourselves to the size of Perry’s body parts, make a panda mask and puppet to take home with you, and play a cool Panda Game. Our big book about pandas will give you and your little scientist the latest information about this wonderful but endangered creature. Animal science is fun! 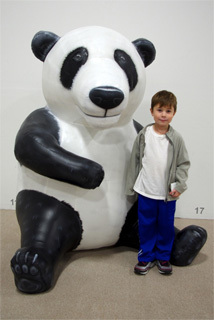 Attention librarians: enough floor space is required to accommodate the 6’high panda model, with room for parents and children to walk around it. Lurking in the library is a Komodo dragon and he looks ready to attack! But no need to fear this largest of lizards – Kodi is a friendly fellow! 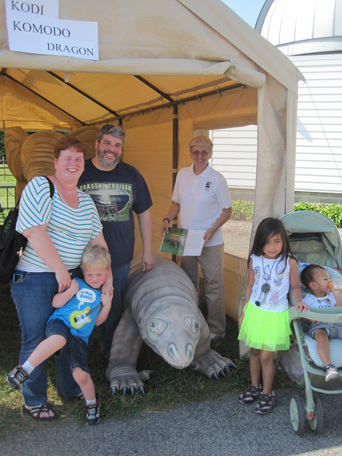 Attend this program and you and your child will meet Kodi, a life-sized inflatable Komodo dragon, and learn about his shrinking habitat on the islands of Indonesia. You will also measure and compare your size to that of Kodi, color his picture and cut and paste a scene of him and his prey, do a hands-on activity to learn about his scaly skin, and assemble a giant floor puzzle of endangered species. Spend some time with a modern-day dragon! Attention librarians: enough floor space is required to accommodate the 9’long Komodo dragon model, with room for parents and children to walk around it. Have you ever wondered about the life of the wild wolf? You and your child will locate wolf populations on a world map, test your nose as you try to identify the scent of your pack, play a game to see how wolf populations change over time, make a Yellowstone Food Web, and use a model to learn about the body language of wolves. Join the pack for a wild time! You mean to say there’s a rainforest gorilla in the library?? Yes – he’s our life-sized inflatable gorilla and he’s waiting to meet you! You and your child will meet Gunther and learn about his African home and his fragile position in the circle of life. You will measure and compare your size to his, color a habitat picture of him and his food, trace your foot to compare it to Gunther’s, make a gorilla mask, and try our gorilla “arms” as you walk like a gorilla. Spend some time with this wonderful but endangered creature! Would you like to know more about tigers? There are so few of these beautiful cats left in the wild! 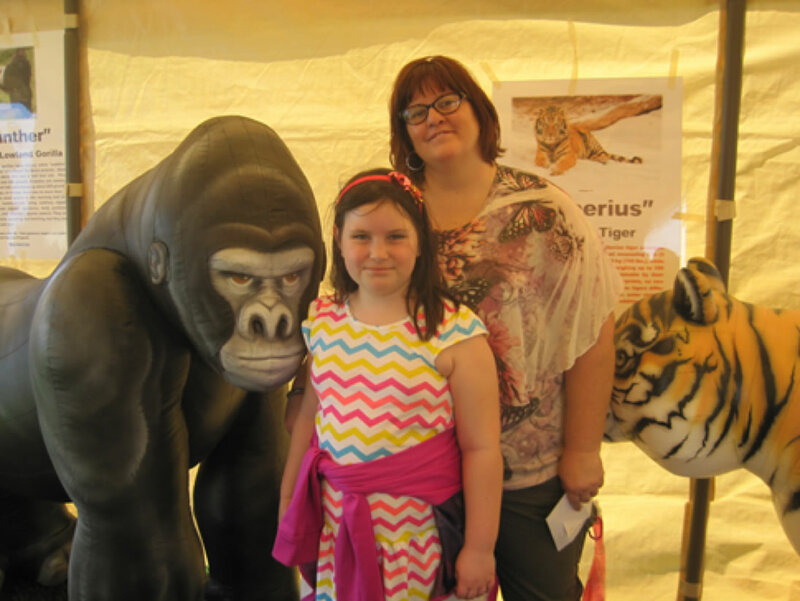 You and your child will meet our 6’ inflatable tiger, while practicing your measurement skills, learn about unique patterns of stripes by playing a matching game, and create your own unique pattern of stripes. You’ll also locate the shrinking habitats of this endangered creature on a map of Asia. Come join the tiger watch! Their habitat is shrinking and the polar bears have moved south – way south! 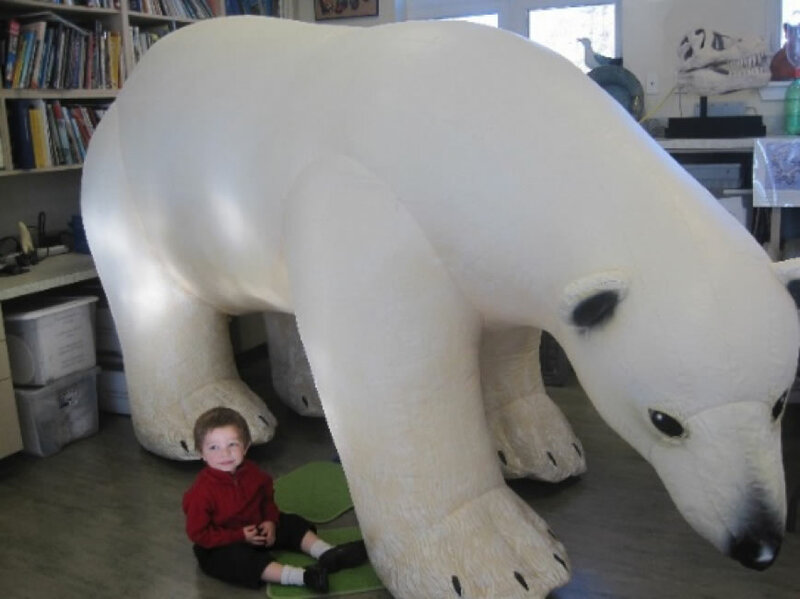 But not all of them; just our life-sized, inflatable polar bear, Piper. Attend this program and you and your child will learn some interesting facts about these beautiful creatures as you measure and compare, assemble a 3D puzzle, and arrange geometric shapes to form a polar bear. You will also make a polar bear mask and an arctic food chain mobile to take home with you. Come visit with this wondrous, white-coated wanderer! There’s a sea cow in the library! That is the common name of the manatee, though there is nothing common about these gentle giants. Attend this program and you and your child will meet Millie, a life-sized inflatable manatee, and learn about her life in the warm Atlantic waters of the Florida coast and waterways. Take some measurements, assemble a manatee puzzle, and make and take a picture of a manatee and a manatee bookmark. Sort blocks that help you compare Millie to her closest relative - the elephant. And, before you leave, make a manatee puppet to take with you. You'll also go home with lots of new information about this fascinating endangered creature!